Last night was, indeed, a special evening at Dodger Stadium. All of the pomp and circumstance you'd expect from the host of the Civil Rights Game on Jackie Robinson Day was there, but amplified. After all, it was like a homecoming, of sorts. Rachel Robinson was there and she was glowing like a beacon of light sprung from the Blue heavens above. She brought with her a legacy that was born out of an desire to break down the walls that separated us all, and in the process helped change the country in ways unimaginable at the time. This evening was an sforzando to a coda that is far from ending. She came to Los Angeles with the reverence of all who attended, and we watched to remember the sacrifices that were made. "How do I feel? I've been waiting, waiting for years and years." Jimmie Rollins wrote a special piece for Sports Illustrated fror Jackie Robinson Day. Check it out here. It's titled, "A special day to be a Dodger: What Jackie Robinson Day means to me." 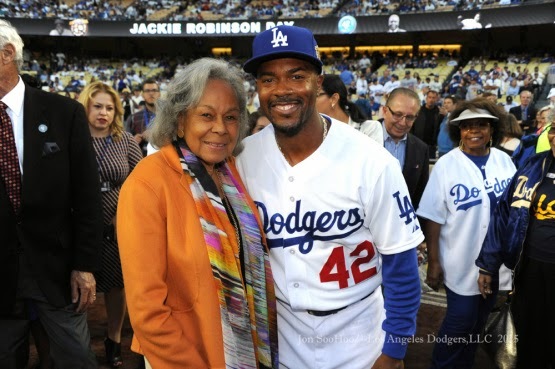 "The real cool thing for me was that I got to meet Rachel Robinson," Rollins said of Robinson's widow, an active participant in the pregame ceremonies at age 92. "I talked to her and thanked her for everything. It was a real honor." Via Chris Lamb at ESPN, "Two who tried out before Jackie Robinson." Night Owl Cards proves once again why he is one of the best sportscard... No, strike that... One of the best bloggers in the business. Check out his fantastic post titled, "'A life is not important except in the impact it has on other lives'" here. Via Mike Oz at Big League Stew, "Jackie Robinson remembered in outer space by astronaut Terry Virts." Awesome! In the Belly of the Beast profiles a stereotypical Giants fan known as "The Hipster." Via Ken Rosenthal at Fox Sports, "Diamondbacks had nothing to do with fan covering up Dodgers blue." 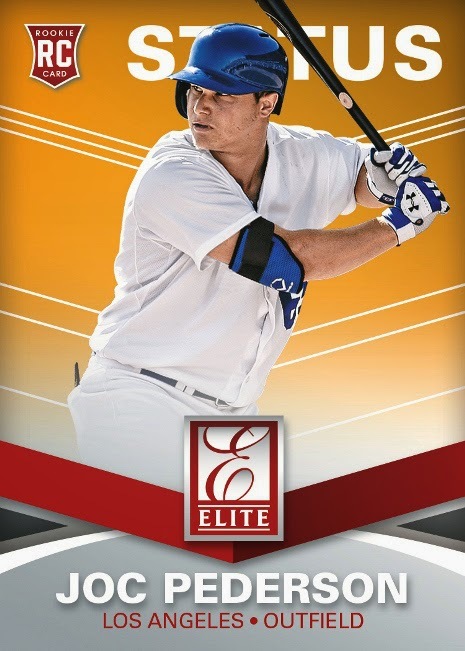 Panini released preview pics of the 2015 Elite Baseball set; including the Joc Pederson card on the right. Go here to check out the other preview photos. The Los Angeles Dodgers today claimed left-handed pitcher Ryan Dennick from the Reds and designated left-handed pitcher David Huff for assignment. Dennick, who is on the 40-man roster, has been optioned to Double-A Tulsa. Dennick, 28, has gone 27-31 with 18 saves and a 3.88 ERA in 210 career minor league games (26 starts) in seven seasons and saw his first big league action last season with Cincinnati, appearing in eight games. Dennick has made two relief appearances for Triple-A Louisville this year, allowing three runs (two earned) in 2.2 innings, and was selected by Kansas City in the 22nd round of the 2009 First-Year Player Draft out of Tennessee Technological University. BTW, reliever Carlos Frias was recalled to join the Dodgers on the 25-man roster. Frias, 25, last pitched on Friday for Triple-A Oklahoma City, picking up the win and allowing three runs on eight hits in 5.1 innings against Round Rock. The 6-foot-4, 195-pounder made four Cactus League appearances (one start) for the Dodgers this spring, allowing six runs in 8.0 innings, and appeared in 15 games (two starts) for the club last year in his first big league action.